About Acupuncture | TNCA, LLC. Acupuncture is an age old medical practice that balances the body’s energy flow with tiny needles. 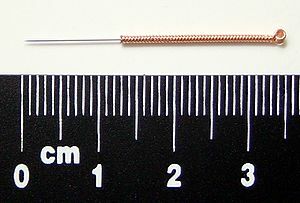 Each needle is inserted into an acupuncture point that conducts the flow of energy. When energy is balanced, pain is relieved and healing happens. Acupuncturists select acupuncture points along the body based on the signs of imbalance that the patient presents with as well as the patient’s main complaint of dis-ease. Traditional acupuncturists look at the patient’s tongue and feel the patient’s pulse on both wrists to determine the signs of imbalance. Tone of voice, physical appearance and other signs may be used as well. Many people are so relaxed during treatment that they fall asleep during their acupuncture session. The most common question asked to an acupuncturist is : “Do the needles hurt?” The answer is: “not generally.” The needles are hair thin “tiny!” and placed in acupuncture points which are not likely to cause pain. The number of treatments needed varies with each patient. Some patients respond exceptionally well to the treatment and will need fewer than the projected number of sessions. Most people need at least 6-8 sessions to feel better and make the improvements last. Many times patients need to come in several times per week to get the results they’re looking for. After a treatment or two, you will have a better idea of how your unique body responds. I think acupuncture is so fascinating! It scared me so much when I was little. The more I think about it, the cooler it gets though. I want to try it one day to see if it is beneficial for me.